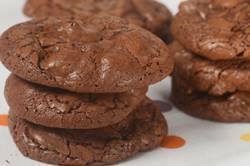 If you like Brownies, then you must try these Brownie Cookies. The batter is almost the same as a brownie batter so the cookies still have that intense chocolate flavor. I love how the thin crust on the outside of the cookie is deceiving. Because when you break one open, you will find that the inside is wonderfully soft and fudgy. Since chocolate is the dominant flavor in these cookies, it is important to use either a semi sweet or a bittersweet chocolate that you enjoy eating out-of-hand. Because the flavor of these cookies will depend on both the cacao content of your chocolate and the brand. Always use a chocolate that has a lovely shiny finish (a sign that the chocolate was cooked at the right temperature for the right amount of time) and one that has that wonderful 'snap' when you break it into pieces. We also add some chocolate chips to the batter. You can use semi sweet, bittersweet, white, or milk chocolate chips. Sometimes I like to use a combination of dark and white chocolate chips. Also, if you like you could add some chopped nuts to the batter. Brownie Cookies: Preheat your oven to 350 degrees F (180 degrees C) and place rack in center of oven. Line two baking sheets with parchment paper. Sift or whisk together the flour, baking powder, and salt. Melt the chocolate and butter in a large heatproof bowl (preferably stainless steel), placed over a saucepan of simmering water. Remove from heat and whisk in the sugar and vanilla extract. Next, whisk in the eggs, one at a time, beating well after each addition. Finally, stir in the flour mixture and chocolate chips. If the batter is really soft, cover and place in the refrigerator until firm. Drop batter by heaping tablespoons onto your prepared cookie sheets, spacing several inches apart (7.5 cm). Bake cookies for about 10 minutes or just until set around the edges, but the centers are still soft. It is important not to over bake these cookies or they will be dry. Remove from oven and place the baking sheet on a wire rack to cool for about five minutes before transferring the cookies to a wire rack to finish cooling. These cookies are best the day they are baked but can be stored in an airtight container at room temperature for three to four days. They can also be frozen.